(Nanowerk News) What was matter like moments after the Big Bang? Particles emerging from the lowest energy collisions of small particles with large heavy nuclei at the Relativistic Heavy Ion Collider (RHICExternal link) could hold the answer. Scientists revealed the particles exhibit behavior associated with the formation of a soup of quarks and gluons, the building blocks of nearly all visible matter. These results from RHIC’s PHENIX experiment suggest that these small-scale collisions might be producing tiny, short-lived specks of matter that mimic the early universe. The specks offer insights into matter that formed nearly 14 billion years ago, just after the Big Bang. Scientists built RHIC to create and study this form of matter, known as quark-gluon plasma. However, they initially expected to see signs of the quark-gluon plasma only in highly energetic collisions of two heavy ions, such as gold. The new findings add to a growing body of evidence from RHIC and Europe’s Large Hadron Collider that the quark-gluon plasma may also be created when a smaller ion collides with a heavy ion. The experiments will help scientists understand the conditions required to make this remarkable form of matter. In semi-overlapping gold-gold collisions at RHIC, more particles emerge from the “equator” than perpendicular to the collision direction. This elliptical flow pattern, scientists believe, is caused by interactions of the particles with the nearly “perfect”—meaning free-flowing—liquid-like quark-gluon plasma created in the collisions. The new experiments used lower energies and collisions of much smaller deuterons (made of one proton and one neutron) with gold nuclei to learn how this perfect liquid behavior arises in different conditions—specifically at four different collision energies. 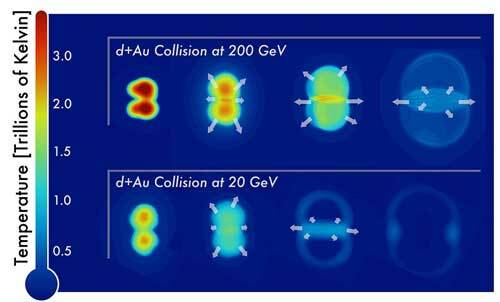 Correlations in the way particles emerged from these deuteron-gold collisions, even at the lowest energies, matched what scientists observed in the more energetic large-ion collisions. These results support the idea that a quark-gluon plasma exists in these small systems, but there are other possible explanations for the findings. One is the presence of another form of matter known as color glass condensateExternal link that is thought to be dominated by gluons. RHIC scientists will conduct additional analyses and compare their experimental results with more detailed descriptions of both quark-gluon plasma and color glass condensateExternal link to sort this out.